Hezbollah says Syrian civil war provided the 'perfect training camp,' promises Israel 'many surprises' in the next round of conflict. 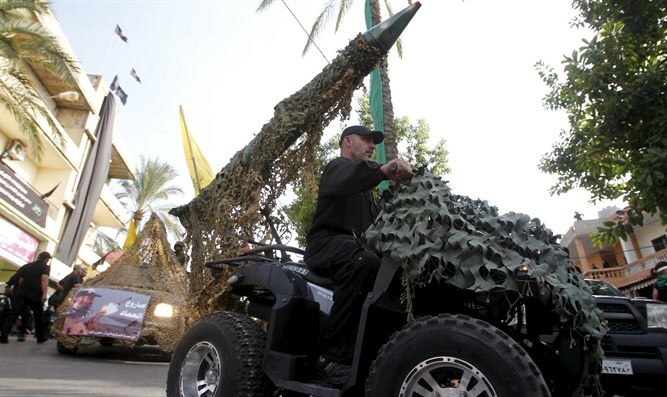 A senior Hezbollah official on Friday told Lebanon's Al Akhbar newspaper that during the next round of conflict with Israel, the terror organization plans to infiltrate Judea and Samaria, Israel Hayom reported. Speaking to Al Akhbar, the official said Hezbollah is preparing "many surprises" for the "Zionist enemy." "A small number of well-armed fighters who are familiar with the enemy's defense system can infiltrate and reach the West Bank, and cause great harm," he said, emphasizing that the Syrian civil war was "the perfect training camp for resistance, fighting in built-up areas, and experimenting with various weapons." "The battle with Takfiri organizations left us ready to fight the Zionist enemy," the official emphasized. "The war is coming....and we are preparing for conflict. It would have been much easier for us to cover the entire south of the country with 10 centimeters (4 inches) of explosives instead of preparing ambushes and explosives for IDF soldiers." The source also emphasized that Hezbollah trains 2,000 new terrorists every year, and has "surprises under every rock and tree."